August is here, which means the back-to-school season is on its way. While there’s still plenty of time to enjoy the summer sunshine (while taking care of your summer hair), it is definitely time to start thinking about which back to school hairstyles you (or your kids!) want to rock on the first day of school. Before amping up your August plans and before the chaos of back to school shopping arrives, make sure to check out the latest hair trends, debate what kind of hairstyle you would like to have this fall and book your appointment with us! You don’t want to go back to school with your unkempt summer hair! This article will help you narrow down your search for the best back to school hairstyles. Braids are one of our favourite back-to-school hairstyles because they are so versatile. No matter the length, colour or texture of your hair, you can toss in a braid for any occasion. If you have longer hair, try a side braid or a fishtail so that is falls in front of one of your shoulders. Tie it off with a clear elastic for a casual, yet chic look. If you have layers in your hair that can’t be tamed into a braid, try a loose braid and allow the runaway tendrils to frame your face. For short or long hair, try a mini-braid coming off of a side part. Use bobby pins to secure it in place. This braid will give you a cute, put-together look that is perfect for the first day of school. Headbands are our favourite hair accessory; they never go out of style! Try a headband tucked around wavy or curly hair and tied with a bow for a cute, yet trendy look. A sporty headband is a comfy way to keep your hair out of your face during a test. Wear a headband with a bow or flower for a little extra flair. The options are endless! From sock buns to top knots, low buns to chignons, buns are an easy way to get a simple, yet sophisticated look. Throw your hair up into a bun with a few bobby pins and hairspray. This look is a quick way to not only keep your hair out of your face while studying, but is a great way to hide your hair when you forget to wash it for a few days (it happens to all of us!). Ponytails are a smart way to style your hair, especially on a bad hair day. This hairstyle will prepare you for a long day in the classroom keeping it out of your face and off of your neck. To give your pony more volume, use a comb to tease your hair. A low, over-the-shoulder pony can be reminiscent of the 80’s, but can also tie together your outfit for a scholarly look. Embracing your sun-kissed, summer waves is a great way to take on back-to-school blues. Loose waves created with a curling wand and mousse make for an elegant look for any hair length. If you have bangs, it may be fun to mix up waves throughout your hair and straight bangs; we think the contrast looks cool and edgy. 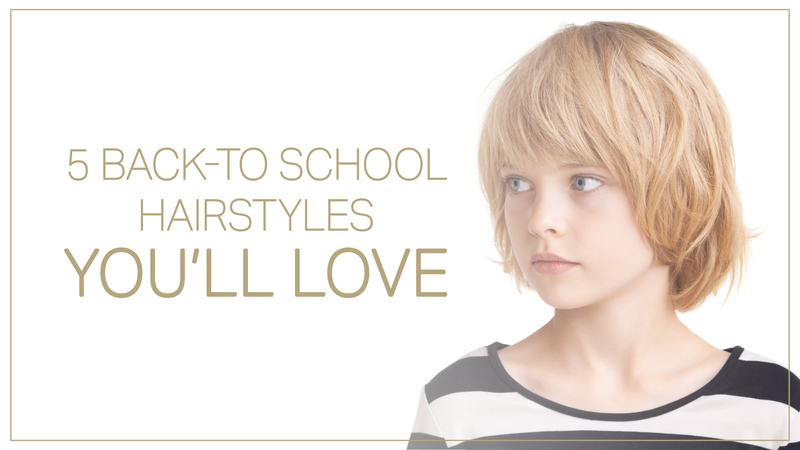 If you’re dreaming up back to school hairstyles, our team has your back. Call us to book your end of summer appointment and take on fall with a fresh style. Whether you’re looking to adopt any of these hairstyles with a short or long ‘do, a new colour or a simple trim, we would love to discuss the latest fall hairstyle trends with you! Wishing you all a happy back-to-school season!